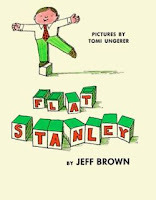 Homeschool Creations: Flat Stanley wins! Flat Stanley will be making the rounds to some of our friends and will be mailed out on Monday to start off our new lapbook unit. We will post pictures of the places that he visits to share along with the lapbook unit that we make. Where will he visit first? He is taking a little trip to Canada and visiting one of our friends there, Amanda! If Stanley wants to visit Costa Rica, he is welcome to visit us. I am reading the first book of the series to my daughter right now.